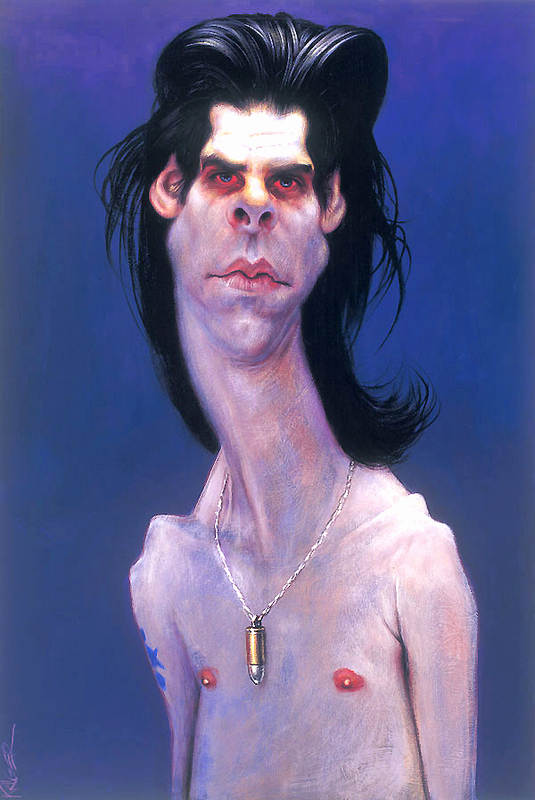 Nick Cave by Sebastian Krüger; acrylic on board measuring 45 X 35 cm. (18 X 14 inches). Nicholas Edward "Nick" Cave (born 22 September 1957) is an Australian musician, songwriter, author, screenwriter, composer and film actor. He is best known as the front man of Nick Cave and the Bad Seeds, established in 1983, a group known for its diverse output and ever-evolving line-up. Prior to this, Cave fronted 'Birthday Party', one of the most extreme and confrontational post-punk bands of the early 1980s. Referred to as rock music's "Prince of Darkness", Cave's music is generally characterized by emotional intensity, and lyrical obsessions with death, religion, love and violence. New Musical Express, music news magazine of the UK, described him as "the Grand Lord of Gothic Lushness". Nick Cave was inducted into the Australian Recording Industry Association (ARIA) Hall of Fame. ARIA awards committee chairman Ed St John said: "Nick Cave has enjoyed, and continues to enjoy, one of the most extraordinary careers in the annals of popular music; beyond comparison, beyond genre, beyond dispute." A stunning piece with vivid colors and incredible technique!